Doug Etelä-Lake Tahoe Loma Cabin - ~ HDTV ~ ja Wi-Fi! Tämä kaunis South Lake Tahoe Lomakoti sijaitsee vain 5 minuutin päässä kaupungin, mutta sijaitsee rauhallisella umpikujaan, jossa maaseudun, woodsy ilmapiiri. Voit katsella tähtiä on 8 henkilöä kuumia lähteitä kylpytynnyri oma terassi. Tämä on totta loma-asunnon - sopii kaikkina vuodenaikoina. Se mukavasti nukkuu 10 aikuista ja on muutaman minuutin päässä järven, kasinot, taivaallinen, Sierra Tahoe ja Kirkwood. Kesäisin on hauskaa kalastus, maastopyöräily, koskenlaskua, ratsastusta tai vain rentouttava. Maailmankuulu Lake Tahoe on vain muutaman minuutin päässä. Muista ja tarkistaa kotisivultamme linkeistä saatavuus sekä enemmän kuvia, meidän hinta takuu ja vuokra info lukien oma FAQ. Meidän kotisivu meillä on myös Lake Tahoe Tietosivu, joka tarjoaa pääsyn kunnosta, säästä, hiihto raportit ja Live Camera laukausta Lake Tahoe. 100 %:n hyvitys, jos peruutus on tehty vähintään 60 päivää ennen saapumispäivää. I was very happy with the cabin itself and it was clean. There were towels and thank god for soap because I forgot mine! Kitchen had just what I needed the grill was perfect for my outdoor cooking just make sure to take your propane tank! Everything was perfect, the only thing was everytime I came out the neighbors were right there watching me, I felt watched by them all the time but besides that everything was pefect!! I'd love to stay again! I recently took the family up to see the snow and decided on Doug's cabin as the place we wanted to stay. The cabin is large with enough room to sleep 10 and offers amenities including a hot tub, TV, wifi, and all the cooking utensils you could possibly need- pretty crucial if you're trying to feed 5 kids without paying hundreds of dollars to take them out to eat each day. 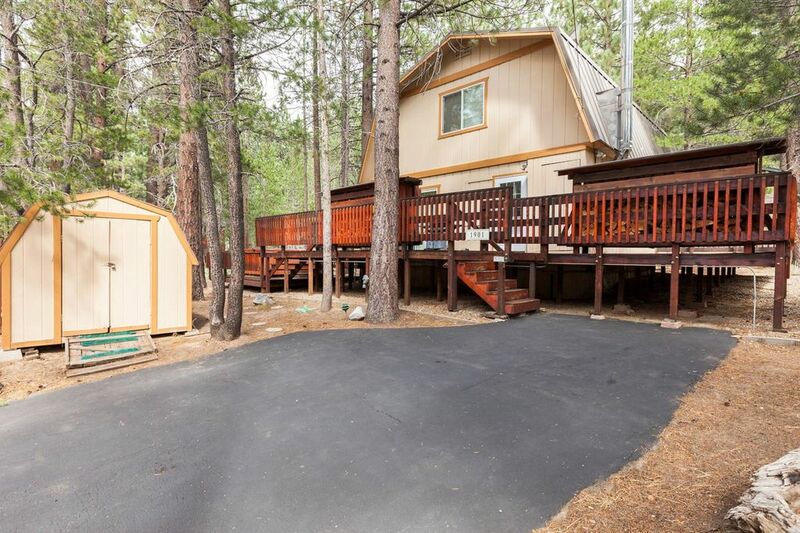 The cabin was clean and cozy with easy access to shops, casinos, and places to play in the snow. There was information about the area available and suggestions on places to go and where to buy a snopark pass, etc. In fact, my only complaint about the cabin would be that the mattress in the room I ended up sleeping in was pretty uncomfortable, but everyone else reported theirs to be perfect... one of them was even a memory foam mattress! I highly recommend this place, and the next time I go to tahoe, I'll be sure to check and see if it's available again! My family and I went in July. The weather was so nice. The house was very clean, we love the spa. the ubication is great, like 5 minutes to the stores and 15 minutes to the lake. We definitely recommend. Stayed here a few nights and my first impression of the home was the smell. When I first arrived the house it smelled like it had been vacant for a while. (OLD SMELL) Maybe invest in plug-in febreze through out the house? After getting over the smell (opening windows ) I did notice that the house was pretty outdated. The beds downstairs are extremely uncomfortable and upstairs are just OK. The best part of the house is the outside hot tub. Very nice with lights and other gadgets. Kids enjoyed that. What truly bothered me the most was the fact that the owner called me one day before checking out questioning me about the amount of people staying at the house. He said that "someone" called him and said that we had over 13 people staying at the house. I will not return to this house solely on those comments. I have stayed at nicer cabins in Lake Tahoe for about the same rate I paid here. NEVER has an owner called me questioning me about any issues. Spent a weekend here with a group of friends -- great location, very well-kept cabin, and wonderful property owner! Doug was great to work with and answered all of my group's questions quickly and simply. The hot tub was the best after a day of skiing! Thanks, Doug!